This may sound like an odd thing to get excited about, but when I first saw this in the list of products in the Marks and Spencer’s Beauty Advent Calendar I was really looking forward to trying it. I think that the Ameliorate brand in general is pretty new, it’s still in the new products section on the M&S website, so this Transforming Body Lotion is a relatively new product. It claims to help rough, very dry skin and was specifically formulated original for skin with keratosis pilaris (skin that looks like permanent goose bumps, which I have, though I’d recommend google for the science behind it) though I didn’t realise that until looking it up now. I was intrigued to see how this would work for me and, although I haven’t used it for the four weeks it recommends because I had the mini size, I can definitely see the difference when I stopped using it and wanted to get this post up as soon as possible really. Their own website has a range of products, I think they all have the formula in that helps rough and dry skin. Marks and Spencer has the full range, including the exfoliator, body wash, hand cream and non scented version. I think I’m going to be getting the set they have to try the others before going for a full sized one. The Transforming Body Lotion itself is also available from Boots. They all cost the same, £22.50 for the 200ml tube, so it’s just personal choice as to who you choose to buy it from if you want to give it a go. The Fortune Cookie Soap Soap Box for the Spring collection arrived on Friday. Though I was away for the weekend so didn’t post on it it also means I’ve had a bit of a play around with most of it to see what I think. Fortune Cookie Soap are a company based in the USA who make bath and body prod icy stone with their signature being the Soap in the shape of a fortune cookie, as you may have guessed. They release a Soap Box full of different products as a preview for their quarterly collections. These are available internationally though postage does put the price up if you’re outside the US. 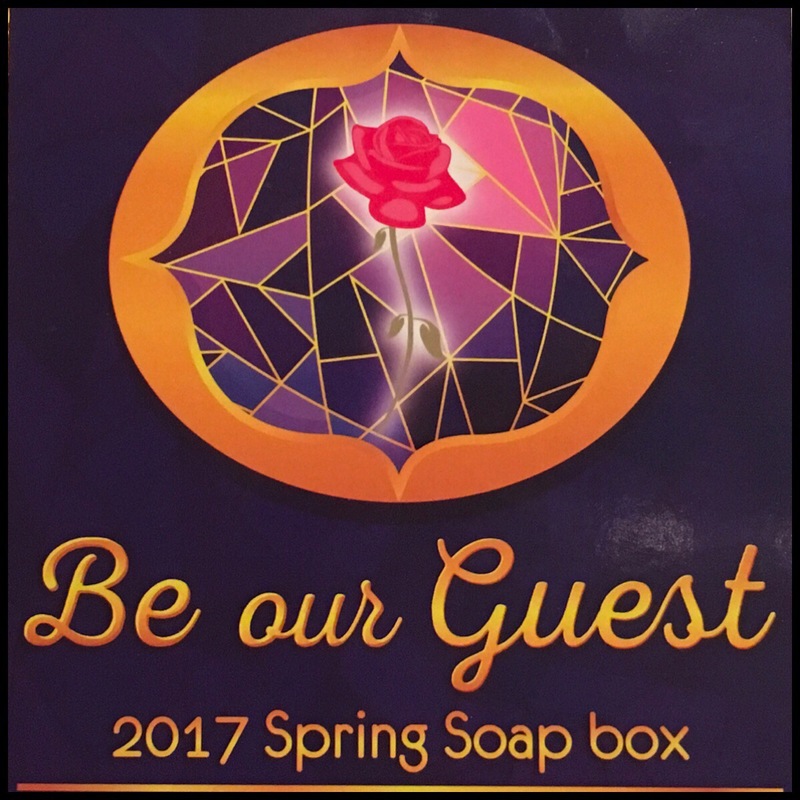 This Spring the theme is ‘Be Our Guest’ so it’s Beauty and the Beast themed as well as most of the products being more spring like scents. It isn’t available at the moment but it will be launched on February 17th at 6pm CST (midnight in the U.K.) and I definitely recommend either getting there at the time of release or waiting a bit as they sell out fast but do normally get restocked. Today’s advent has a Cosy By the Fire tea light for the second day in a row, I guess they did it randomly but it would have been nice to have a bit of a gap between the same scent. The Ciate today has a really dark berry red, it’s so dark to see the more berry side of it and it looks like a very dark brown. I love the range in this year’s Mini Mani Month, it’s like a mini nail varnish collection in one go, I think it’d be a good gift for any nail varnish fan and down at half price at £25 on their own website if you want to get it. 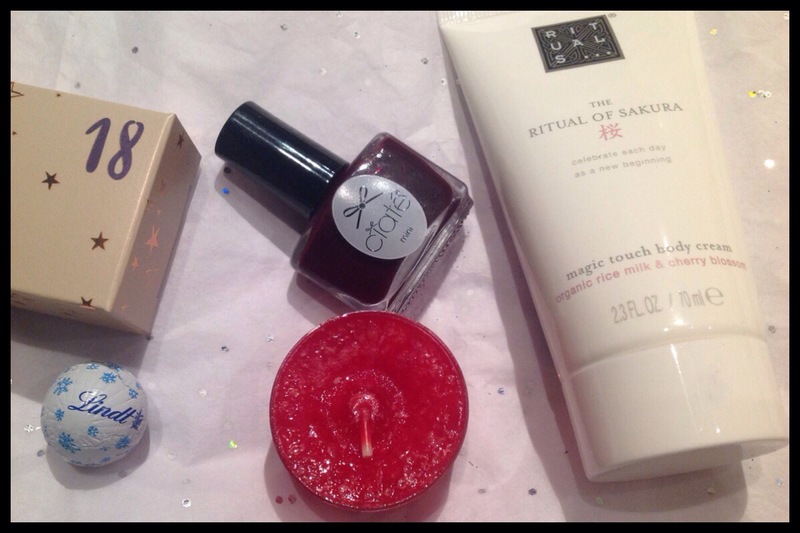 The Marks and Spencer beauty advent calendar has a tube of Rituals The Ritual of Sakura Magic Body Touch Body Cream, it’s the cream version of a shower gel foam we got last year so it seems like it’s a popular scent. This post is kind of a mix of first impressions, a recent purchases haul kind of post and some mini reviews as I bought a mix of new things to me and old favourites. I’m going to go into more detail with a couple of them in the future when I’ve tried them out some more. Two of them are from the Lush Kitchen which means they’re limited edition, the one is online only but the other is available in Lush Oxford Street store if you live near there. In this order I bought the Olive Branch shower gel in the 250g size, the Self Preserving Dream Cream and a 250g chunk of Dream Wash from the permanent line as well as the Comforter Shower Jelly and the Perspective lipstick which is the one from the Oxford Street store. There is a version of Perspective available on the website, it’s in the original Emotional Brilliance glass bottle style packaging, but this is the more solid stick lipstick style, I’m not sure how they compare but just to know this exact product isn’t available online any more. I don’t really subscribe to any other beauty boxes but I do get this Soap Box from Fortune Cookie Soap, they release a box four times a year which has smaller products and samples of the scents for the seasonal collections not long before they release them. Fortune Cookie Soap are a cruelty free company from America who sell bath and body products and perfumes. The Soap Box includes eight products, two of them are full sized, and cover all of the scents in the upcoming range. This season’s theme is Just Keep Swimming which is inspired by Finding Nemo and I think this may be one of my favourites yet. I love the packaging for the products and the names really go with the theme and the more well-known quotes or characters. As these arrived on Friday I’ve had a bit of a play around with everything and used everything. This collection will be released on May 20th 6pm CST, which I think it around midnight in the UK. 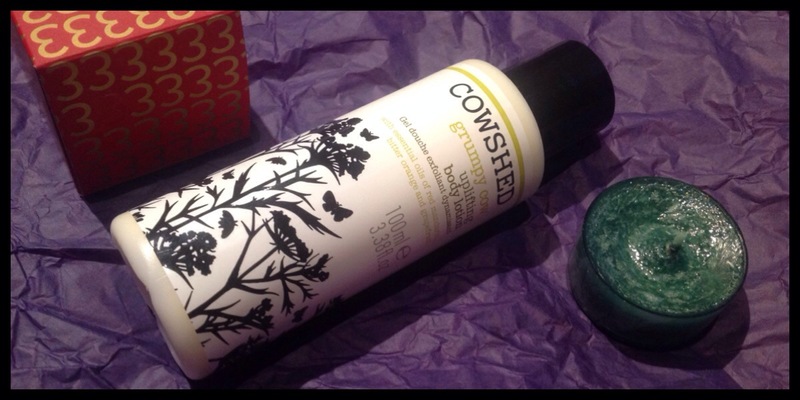 It’s time for day 3 and today’s M&S advent calendar product is the Grumpy Cow body lotion from Cowshed. They’re a company I’ve heard a lot about and I think I’ve tried some before, this is a 100ml size bottle which is available from their own website but I think everyewhere else it’s larger bottles and this is in gifts. It’s a nice travel size and has a fair amount in to give it a proper try. The Yankee. Candle tea light this time is in Christmas Garland which is a nice Christmassy smell and I really like the picture that it shows for the label for this one. Hi guys, this is a bit late since I got this box last Monday but I’m still posting before the Christmas range is available so it’s still on time, kind of, and I’ve had a chance to play with everything as well! This is another Enchanted sample box, this time for the Christmas range which is always amazing and I always end up buying way too much from there. These sample boxes contain a range of products in different scents, like the Fortune Cookie Soap Soap Boxes, and are great for testing out scents before the release. There’s no specific theme this time, it’s a mix of traditional Christmas scents with some others but I’ll go through them in the review. Unfortunately Enchanted will be closing after Christmas though you can still order anything on there now until then and these Christmas products are going to be released this weekend. I did think it was this Saturday but on the piece of paper it says the 8th which is Sunday so I’m not sure now. I’ve done a few posts about Enchanted preview boxes this year and Saturday the latest box for the collection being released on August 1st arrived so I had to do a post on it. Enchanted are a bath and body product company and the preview box is like the Fortune Cookie Soap box in that it’s released before a collection and one for each season so four in a year. These boxes contain sample sizes of the products, there’s a good range of both scents and product types in these normally and includes things like lotions, scrubs and wax melts as well as some perfume oil normally. Buying them all at the beginning of the year there was a discount but now you can only buy the last one for £22. It’s available until October 1st and is the Christmas collection. This season’s collection is all Alice in Wonderland themed which I love and couldn’t wait to see the scents and names that would be in it. It seems to be a popular theme with a lot of companies choosing it but I don’t mind as I love the books so any variation on Alice themed things is good for me.